A unique new blend of Kiyoseki and tourmaline minerals fused with ceramic to bathe hair in shine producing ions. 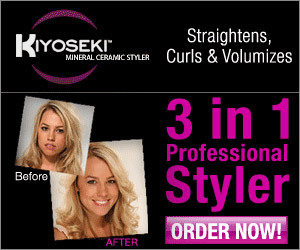 Kiyoseki Mineral Ceramic Styler is a 3-1 professional hair styler that harnesses the power of improved ceramics, your hairs own conditioning moisture, plus mega ion producing minerals to straighten, curl and volumize all in a single pass! Kiyoseki uses solid ceramic heaters in corner to corner contact with mineral ceramic plates, evenly distributing far infrared heat, to style hair from the inside out.